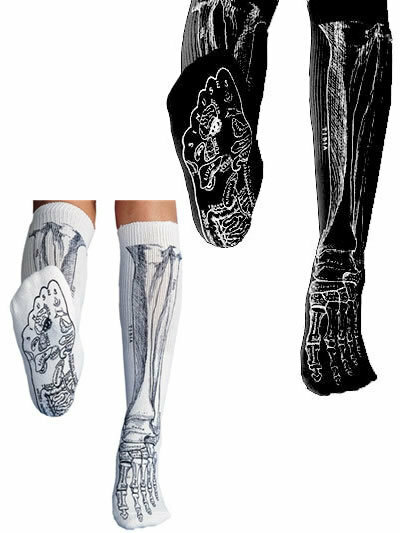 These fun and educational socks are a fun way to study your lower leg and foot bones, while keeping your toes toasty. These socks are adult sized, one size fits all tube socks, printed with all of the bones of the lower leg and foot. As an added bonus, the sole of the sock has additional reflexology mapping. By themselves, we suggest these sock as a gift for anyone enthusiastic about anatomy. When accompanied by a skeletal chart or study guide, they can be a great basic study tool, as well! 60% cotton/35% polyester/5% nylon, for a great blend of comfort, warmth and style. Made in the USA by Anatomical Chart Company.